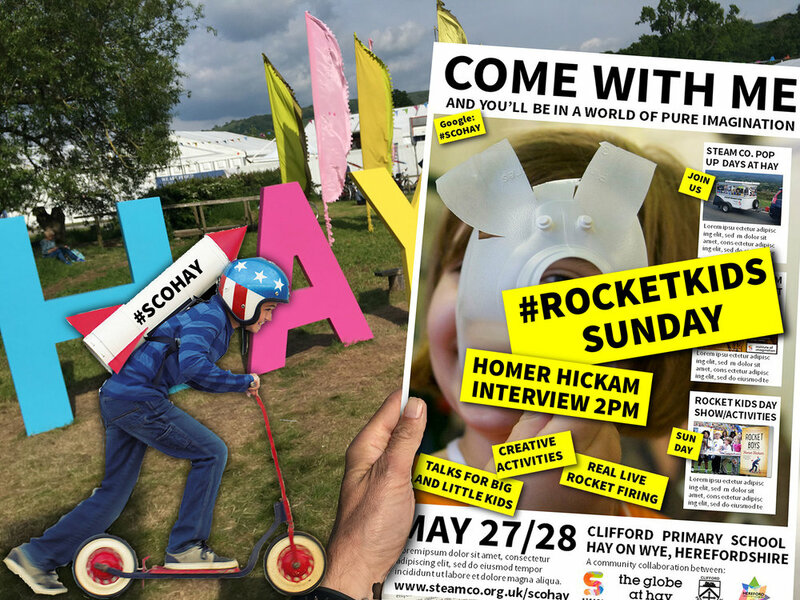 Pop Up Days At Hay #SCOHAY — STEAM Co. If you know the story behind the 'Rocket Kids' STEAM Co. Sampler session, you'll know how a book that a grandad found in the Oxfam bookshop he volunteers in, inspired his son to inspire his sons and other people's children. You'll also appreciate how special it was for us to collaborate with the community and county that hosts the UK's if not one of the world's most famous literary and arts festivals, the Hay Festival. And to support their bid to be UK City of Culture in 2021 with a unique proposal, not to just connect and inspire a city... but a city and every town, village and hamlet across a county. Find out more about the weekend's activities and excitement in the film below. When Shropshire Lad and STEAM Co. Co-founder Nick Corston's dad gave him a book he'd found in the Oxfam bookshop he volunteers in just up the border in Ludlow, he said it was the best book he'd ever read, (and he's read a few). 'Rocket Boys' by Homer Hickam is the story of four kids growing up in a dead-end coal mining town in West Virginia in the 50's, but on seeing the Sputnik and with the encouragement of their mother, a teacher and a book, they go on to make rockets and end up working for NASA. You couldn't make it up which probably explains why it turned out to be a best selling book (New York Times No. 1) and top grossing movie ($35m). It's a story of invention, determination and the power of family and community. The perfect message for our children. 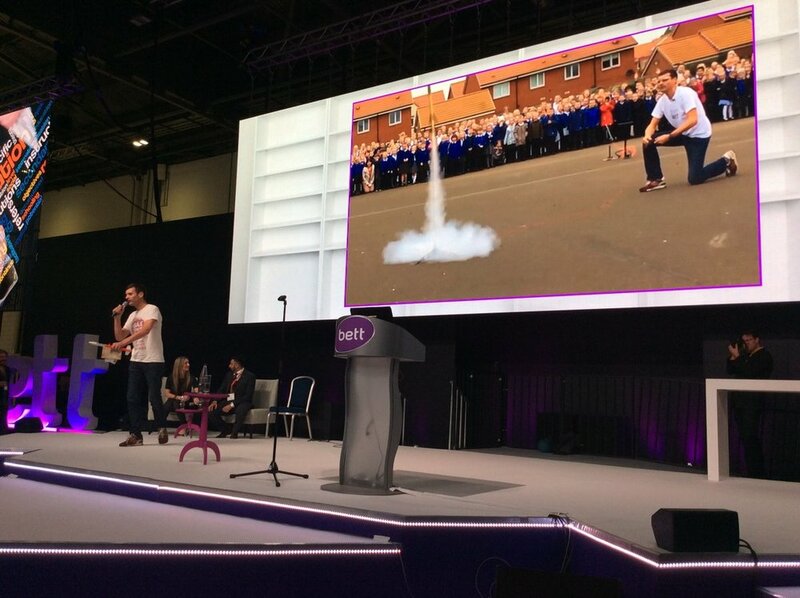 After an initial debut at Camp Bestival last year, Homer Hickham gave STEAM Co. permission to take the Rocket Boys story into every UK primary and secondary school as the STEAM Co. 'Rocket Kids' sampler - an all school assembly, real rocket firing and paper air rocket making/firing workshop. It's been in schools from Liverpool to London, Sunderland to Southampton. And now we're bringing it to Hay during its world famous literary festival as part of our Pop-Up weekend in a collaboration with some very special new friends of ours - The Globe at Hay, Clifford Primary School and Hereford City of Culture 2021. We're very excited to be hosting an exclusive Hay premiere of a film at Clifford Primary School on a subject that will be close to the hearts of all Hay Festival goers: Creativity and Children. 'Most Likely to Succeed' is the Sundance nominated film film that's been created to jump start conversations in communities about how we educate our children. It's helping school communities re-imagine what our children and their teachers are capable of doing. After the film, we'll be holding one of our heated discussions with a panel of specially invited guests and our audience around the issues raised around educating our children for the fourth industrial revolution that is unfolding at the speed of light. We have 200 seats, from free (for unwaged but engaged) £5 for early bird parents to £10 those with expense accounts. Tickets here. For more information on the film, the format of the evening or to collaborate with STEAM Co. on a similar screening in your community anywhere in the UK, click here. We'll be running the STEAM Co. Rocket Science activity where everybody will get the chance to make and fire a compressed air rocket. If you get everything right and hit it with 200 PSI your rocket could go 200 feet in the air. As a non-profit charitable initiative, STEAM Co. requests a donation of £1-2 per rocket which includes 3 firings. We will also be selling the amazing Air Rocket launcher that we are importing from the USA for use in schools. In the unlikely event of bad weather this will run in the school hall. No tickets required. Just turn up. We aren't messing about. We'll be firing real black powder gun powder powered rockets to heights of about 600 feet, with parachute recovery systems. Join us for the count down (weather permitting). No tickets required. Just turn up. Get tickets for 'Rocket Kids' story here. Join us for this roller coaster journey through STEAM powered innovation from steam trains to rocket ships to electric cars. We'll look at how they work, who invented them and Homer Hickham's inspiring 'Rocket Boys' story. A Hay exclusive. This session, for grown ups will dig a little deeper under the Rocket Boys story and discuss the power of Parents, teachers and community to Inspire our children's futures. It will consist of a discussion with special guests and a live interview with Homer Hickam, best selling author of 'Rocket Boys' and other fine books, not via cardboard com this time, but real video link, live and direct from the USA. Get tickets for the 'Rocket Boys' talk here. We can't wait for this and know it will be a major sell out with educators, parents and rocketeers across the land making a parabolic beeline curve to Hay. Inspired by Seth Godin, at STEAM Co. we say that Art is what we call it when what we do might connect us' and believe we are all artists. Your art might be painting or dance, DJing or drawing, baking or football. When, Darren Henley, CEO of the Arts Council visited Sunderland last year calling for a 'creativity revolution' we took him at his word and launched one. #ILoveART from @people4art is a celebration of our art. Come along and design your own #ILoveART logo and print it on a t-shirt to wear with pride at Hay and beyond. No tickets required. Just turn up. An independent arts centre, embracing an ever changing arts landscape. The team behind it believe firmly in the ‘Town of Books’, and its community, the globe pledges to invest in making a space where all can come together to share in culture and expression. We want to ensure that being based rurally is no barrier to exceptional events. This school is situated in the beautiful rural corner of Herefordshire, at the end of the Golden Valley, 3 miles from Hay-on-Wye and close to the Black Mountains. Clifford Primary School is a friendly, caring, innovative and well-resourced educational environment, where you are sure of a warm welcome from their dedicated team who aim to create a feeling of family. We're delighted to support this bid, unique because it’s for all of Herefordshire, not just Hereford City itself – every town, village and hamlet in the county is included, and the programme has something for residents of all ages, backgrounds and locations. They want to create a year-long party of amazing events and festivals in communities for everyone to access.